obsolete concepts and theories of the 1930s that have persisted into the 21st century. This tutorial presented here is the scientifically accepted, proper explanation of colour as may be confirmed by experiment and by logic. and illustrated in the discussion that follows. first letters. This is only for distinction during the lesson. The Look of Colour. Realise that something appears the colour it is because it reflects or transmits the colour we see and essentially absorbs or blocks all other colours. A Red cloth looks Red because it reflects Red and absorbs the rest. A Red piece of clear glass or plastic passes Red light through it because it transmits only Red and absorbs (or reflects out the back) all other colours. Seeing Colour. Of the seven basic Spectrum Colours, the human eye has receptors for only three: Red, Green, and Blue. The brain interprets other colours by combinations of stimulations to each of these three colour receptors. These three are considered as the "Primary Colours", or "Additive Primaries". They can be represented by Red, Green, and Blue coloured lights. The following chart shows how the Primary Colours combine to form the Secondary, or "Subtractive" Primaries. Creating Secondary Colours. The Primary Colours must be combined in the correct amounts so as to form the Secondaries. These created colours are realised by varying the quantities of the Primary Colours. For example, shining Blue and Red light in the proper quantities will create Magenta. However, Purple will result by using considerably more Blue than Red. Conversely, using more Red than Blue will create Pink. This can be seen in the chromaticity graphic at the start of this article as the eye moves from the fully blue point along an imaginary line toward fully red. Adjust the dimmers in varying ways to see what colours result. You will notice that as you add more and more coloured light, that near-White light will eventually result if the amounts of each of the three colours are in correct balance. It will not likely be perfectly white because the filters would have to be very precise. (Your stage lighting filters are not precise, and need not be for most purposes. Alternatively, placing more and more gel in front of one another in just one fixture will result in black because each filter will successively filter out more and more colours. Even stacking the same colour will result in black if enough of them are used because transmittance of a given colour is not 100%. Thus each sheet of gel added will reduce the light output just a little more until most or all of the light is absorbed. Source Colour Temperature. Because of the impurity of colours in gel, 3200K colour-temperature sources are recommended so as to come closest to standard results. This specification will be shown on most replacement lamp boxes; if not, a fast Internet or catalogue search will reveal the information. Recombination. Focusing now on the Secondary Colours, these are best represented by Cyan, Magenta, and Yellow coloured inks. Painters, dyers, and printers call these Secondary Colours the "Primary Pigments" or "Primary Inks". These may be re-combined in various ways to get the Primary Colours. In lighting, the same results may be had by combining Cyan, Magenta, and Yellow coloured gel in front of a single light source, one sheet in front of the other, as seen in the following chart. The Common Colour. Notice that the resulting colours are those that are common to each of the Secondary Colours which are being combined. Using a pigment example, Yellow ink is made of Red & Green, while Magenta ink is Red & Blue. The common colour of Red is the result when the two Secondary Colours of Yellow and Magenta are combined because they BOTH reflect Red while each absorbs the other's remaining colour. This absorption happens because one of the colours does not reflect Blue and the other does not reflect Green. More Experimentation. To translate the preceding to stage lighting, place a Magenta gel into a single theatre light and put a Yellow one in front of that; the colour shining out will be Red. This is because the Yellow filter blocks transmittance of the Blue component of the Magenta, while the Magenta filter blocks the Green transmittance of the Yellow. Since both filters can transmit Red, that is what we see. Once again, other colours may be formed by adjusting the quantity of each individual colour by selecting a more, or a less, saturated Secondary Colour to use when doing the combining. ("Saturated" colours are those that are deeper, as opposed to "pastel" ones, which are lighter in colour.) Again, because of the impurity of plastic colour media, 3200K light sources will produce the closest results. Experiment to find that as you add more than two Secondary Colours of gel, the result will eventually approach, and then become, Black. That is, no light will be transmitted. Even stacking the same colour will result in black if enough of them are used because transmittance of a given colour is not 100%. Thus each sheet of gel added will reduce the light output just a little more until most or all of the light is absorbed. A Fallacy of Combination . People have a tough time understanding Secondary Colours. Many believe that by combining Blue and Yellow paints they will get Green. However this is not so. Truly Blue paint contains only one colour: Blue. So Red and Green are absorbed while Blue is reflected. Regarding Yellow, Red and Green are reflected while Blue is absorbed. Should these two colours be combined (Blue and Yellow), Black will result because the Blue content will absorb Red and Green (Yellow) while the Yellow content will absorb Blue. So all colours get absorbed, thus resulting in Black. (In actuality, a muddy brown or grey will result because the paints are unlikely to be absolutely pure in colour. If they are very impure, other colours may even result.) In the case where combining apparently Blue and Yellow paints does produce Green, then the Blue paint is actually some shade of Cyan and not truly Blue. Altering Colour Balance. Shades of a given colour are made by subtle variances of one or more colours. Thus when using two light sources, one each red and blue, by adjusting the dimmer to change the amount of light from each, a wide range of pink shades will result. Study the area between those two colours on this webpage's opening chromaticity graphic to see these shades. Adding White. A pastel is made by adding white light to an existing colour so as to lighten it. In reality because white light is made of all colours, one is adding to the starting colour those colours that are missing or weak. This alters the starting colour's saturation. So for example, a blue can be made to range from a deep midnight blue to a light, subtle blue. 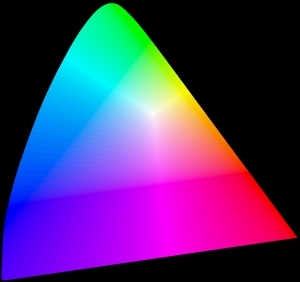 Again, view the chromaticity graphic; trace blue, or any colour, from its deepest toward the bright, white area at the upper right to learn that as one approaches that point, a range of pastel shades will result. Be aware that one may have to trace a curved line to see this exactly. Atlantic Illumination is a Lee Filters dealer and has been since 1975. This British company has an extremely wide selection of gel colours. experiment with the colours discussed in the preceding lesson. You may order them from us as full-size separate sheets (~ 510mm X 600mm). Large rolls are also available. E-Mail AIEL, or see the AIEL Market. of Green, then that Blue is actually a shade of Cyan. By definition, Blue absorbs Green (and Red).